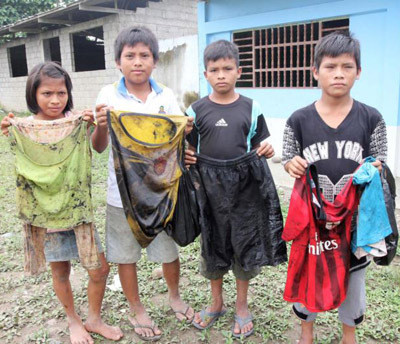 Awajun children in the community of Nazareth, at the confluence of the Chiriaco and Maranon rivers in northern Peru, show the clothes they wore — with no protective equipment — to scoop oil out of water near their community after a pipeline break. (CNS photo/Barbara Fraser) See PERU-OIL-SPILL-SCHOOL Feb. 24, 2016. WACHAPEA, Peru (CNS) — Five hundred indigenous middle- and high-school students will arrive in early March at a Catholic-run boarding school in this Awajun village, but the sisters and staff do not know where they will take baths. The Chiriaco River, where the students usually bathe, play and wash their clothes, turned black Feb. 10, as oil from a broken pipeline upriver washed downstream in a heavy rain. Although the slick is gone, a tarry residue remains on the soil and plants along the riverbank. “We need information about what lies ahead, about the health precautions we should take, about how long it will be before people can fish again,” said Sister Carmen Gomez, a member of Servants of St. Joseph mission that operates the school. The pipeline break was one of three that occurred in northern Peru between late January and mid-February, bringing to 20 the number of oil spills from the pipeline since 2011, according to Peru’s environmental oversight agency. Bishop Alfredo Vizcarra Mori of Jaen, which includes the mission here and neighboring communities, called for thorough cleanup and remediation of the affected area and payment of damages to communities. Villagers in Wachapea had never seen a disaster of this magnitude, Sister Carmen said. A farmer upstream spotted oil seeping from a buried pipeline Jan. 25. Workers from the state-run oil company Petroperu, which operates the pipeline, arrived soon afterward, but it took them three days to repair the break. Meanwhile, about 2,000 barrels of oil spilled down a stream. 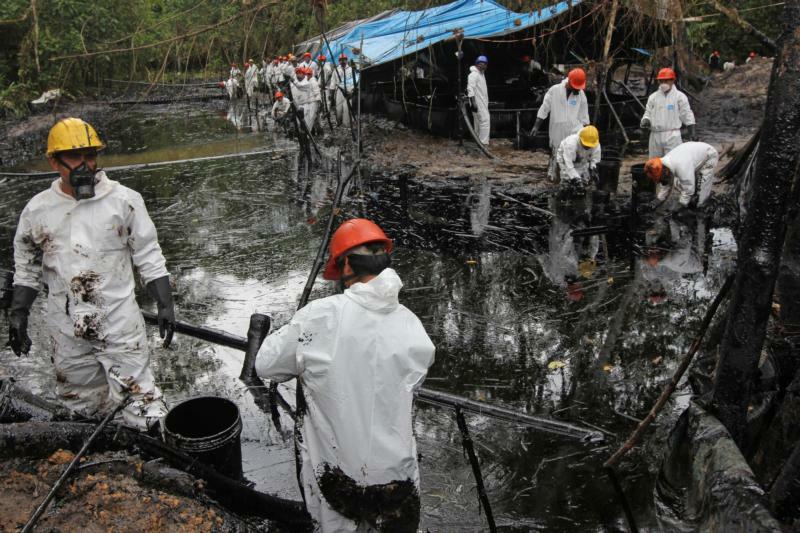 Workers set up barriers to contain the oil, but heavy rains Feb. 9 swelled the stream and washed oil into the Chiriaco River, then into the Maranon, one of the main tributaries of the Amazon. Local residents watched the slick flow by for most of the day. When oil pooled in a backwater near the school, they headed for the riverbank with buckets to scoop it out of the river, even though they had no protective gear. They were spurred partly by the company’s offer to pay about $43 per barrel of oil collected and partly by a desire to clean up the river, which is the mainstay of life in this part of the country, where there are no roads and people live from fishing and subsistence farming. “They did it out of need, but without any safety measures,” said Luis Chavez, vice principal of the school, which serves communities that are among the poorest in Peru. Health workers counted more than 200 people along the Chiriaco River, including about 80 under age 19, who had collected oil in buckets with no protective equipment. Farmers downstream from the pipeline break “won’t be able to irrigate their crops or water their animals with that water,” he told Catholic News Service. The vicariate, similar to a diocese, called for payment of damages to people whose fields were affected, remediation to guarantee safe water supplies for people and livestock, and ongoing monitoring of water quality. The statement called on officials to keep local residents informed about actions being taken to protect their health and the environment. “We also believe it is very necessary to attack the causes of these accidents, so they are not repeated,” the statement said. Just a week after the oil spill in Wachapea, a pipeline spur in the northeastern Loreto region broke, spilling about 1,000 barrels of oil into the forest and down the Morona River past Wampis indigenous communities. And on Feb. 17, about 300 barrels spilled into a rice field while workers were repairing a section of pipeline that had been punctured by a rock about 70 miles west of Jaen. Two oil spills from the pipeline in 2014 fouled land and waterways in the Kukama communities of Cuninico and San Pedro, in Santa Rita de Castilla Parish in the lower part of the Maranon River valley. That area was once a rich fishing ground, providing both food for villages and an income for fishermen, according to Cesar Mozombite, leader of the Catholic community in Cuninico. Since the spill in June 2014, however, buyers shun fish caught in that area, and villagers are afraid to eat the fish. Despite eight months of cleanup efforts, traces of oil still flow past the village after rainstorms, he said.